It is held every year on the 31st of March. 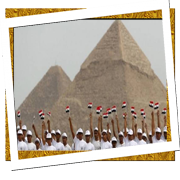 It commemorates the struggle of its citizens during the revolution of 1919. the revolution moved to upper Egypt, so the occupation troops went to fight it. The people of Giza stopped their train and a battle, in which 21 people died, took part. Many people were arrested and accused of killing a soldier and an officer. In this occasion many festivals are held. It includes a tourist exhibition and the inauguration of the imported projects in different fields in the governorate. It is held every year on 27th of September according to the world tourism organization. 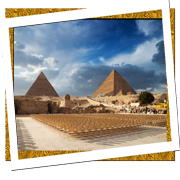 It is held in the pyramids area. Art and music shows are part of festival. There also shows of horse dancing and Egyptian flute (Mizmar). Tourist brochures and flowers are given to tourists on that day. It is held every year. It is organized by the German School in Dokki with the Giza Governorate. About one thousand people take part in the race. Their ages range from 4 years to 70 years. It stars in the Pyramid area. It is 8 k.m. long. 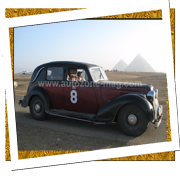 It is held by one of the Egyptian tourism Agencies in collaboration with British company, the Egyptian club for cars and trips and the British club in order to organize a trip by the historic and classical cars under the name of (Historic Cars Rally). This race includes about 50 classic cars (that have been produced in the period from 1907 to 1968). 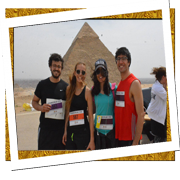 The official beginning of the race is at the pyramids area. 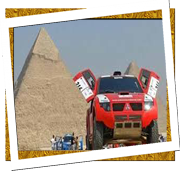 Cross Egypt Challenge is a series of endurance cross-country motorcycles and scooter rallies throughout the toughest tracks of Egypt. The series is aiming to promote Egyptian tourism and is running under the supervision of the Egyptian Ministry of Tourism and the Egyptian Tourism Authority. 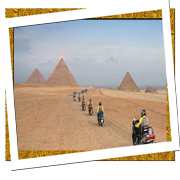 The series started in 2011 and the first challenge was 9 days ride from the shores of the Mediterranean Sea in the North of Egypt to the temple of Abu Simbel, on the southern borders of Egypt with a total distance of over 1700 km. International cycling Race organized by Egyptian Tourism Development Authority in collaboration with the Canadian company, which is shared by many different nationalities from European countries where the race begins within the borders of Egypt in front of the panorama of the pyramids and ends at the Egyptian-Sudanese border.